A Hawaii Civil Defense Warning Device, which sounds an alert siren during natural disasters, is shown in Honolulu on Nov. 29, 2017. The alert system is tested monthly, but now Hawaii residents will hear a new tone designed to alert people of an impending nuclear attack by North Korea. 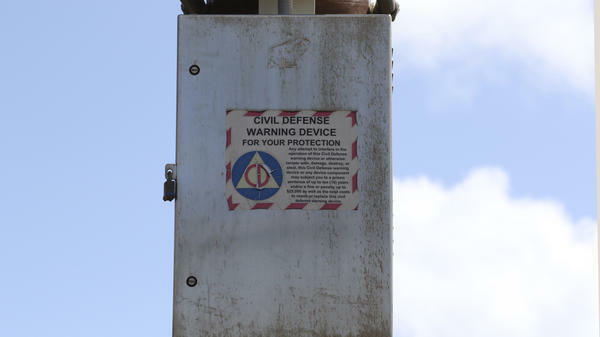 The nervousness over North Korea's missile tests has led Hawaii to bring back air raid sirens. Here's a public service announcement for the new monthly tests. SHAPIRO: In most of the U.S., local authorities have not made a public show of preparing for nuclear attack. NPR's Martin Kaste explains why. MARTIN KASTE, BYLINE: Seattle has the dubious distinction of being the mainland big city that's closest to North Korea - as the ICBM flies, at least. So, yeah, this is something that the city's emergency management director has thought about. Barb Graff works in a bunker-like building downtown. BARB GRAFF: If the military tells us this is where we - our best guess is something's going land, we will use all of our systems to warn the public right away. KASTE: The air raid sirens here are long gone. Instead, Graff says they'd send out alerts by radio, TV and smartphone. But even if people got that alert, would they know what to do? GRAFF: We're beyond the generation now of remembering what Hiroshima and Nagasaki looked like and what this kind of a threat looks like. UNIDENTIFIED MAN #2: An attack could come without warning. KASTE: ...Because of civil defense films like this. UNIDENTIFIED MAN #2: The sky would suddenly light up. If a doorway is right at hand, use it. If the nearest shelter is more than a couple of steps away, fall to the ground immediately. KASTE: We make fun of those films now, but the information in them wasn't that bad. BROOKE BUDDEMEIER: So the concept of duck and cover really came from the idea that you had the ability to protect yourself from those prompt effects. 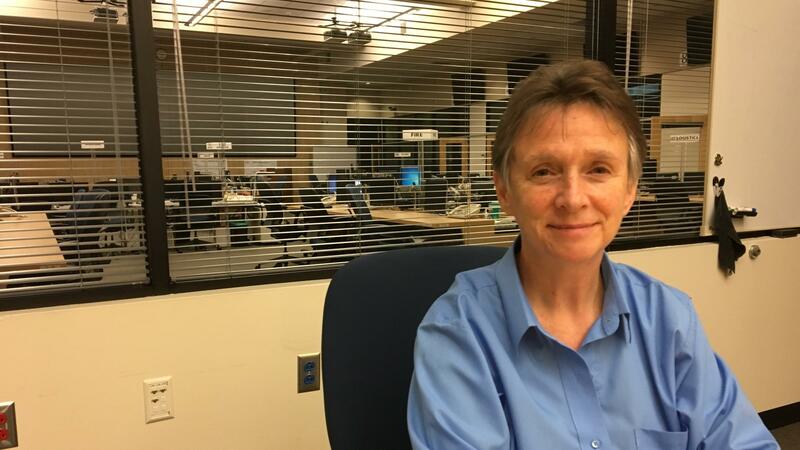 KASTE: This is Brooke Buddemeier of the Lawrence Livermore National Laboratory. He's an expert in health risks in a nuclear attack. And he says seeking shelter made sense, especially in the early days of the Cold War, when nuclear weapons were less powerful. BUDDEMEIER: You know, for a smaller sort of low-yield nuclear detonation in a modern, urban city, even near the detonation, there is a very good chance of survival if you can get inside, stay inside and stay tuned. KASTE: And with North Korea, we may be facing just this sort of threat - a few smaller bombs, sort of a back-to-the-future to the early 1950s. What's different today, though, is that the government has become leery of public awareness campaigns on how to survive such an attack. You can seek out the information, for instance, on the ready.gov website, but duck-and-cover films are not making a comeback in elementary schools. In Washington state, there's even a law passed in 1984 that forbids local planning for nuclear attack. ALEX WELLERSTEIN: Civil defense got very politically controversial in the 1980s. It became tied to President Reagan's appearance of escalating the arms race. KASTE: Nuclear weapons historian Alex Wellerstein, who now has a Carnegie grant to try to reinvent civil defense for the 21st century. He says a big mistake in the Cold War was the lack of honesty about how the growing arsenals made survival less likely. WELLERSTEIN: They really didn't want to be - have to say, well, there's isn't a lot of work we can do for these people because if the Soviet Union launches 30 nuclear weapons at New York City now, you guys aren't going to make it. And not being able to sort of fess up to that fact, I think, discredited a lot of their work. KASTE: So today, most local plans for a nuclear attack are low-profile if they exist at all. Instead, emergency managers take what's called the all hazards approach. They figure they can apply to a nuclear attack the same skills they'd use for other crises such as earthquakes. But Washington State Senator Mark Miloscia, who's a former Air Force bomber pilot, would like to see more specific planning for nuclear attack. He thinks the current approach has become too fatalistic. MARK MILOSCIA: To say give up hope and just die, I don't think that's the best of any sort of American spirit. And to say that the leaders embrace that sort of way of thinking that, oh, everybody in my city - or I'm responsible - you're all going to die - you're not really serving the public. KASTE: While many people would find it depressing to plan for the unthinkable, he finds it depressing not to. Martin Kaste, NPR News, Seattle. (SOUNDBITE OF DELAVEGA SONG, "ON MY MIND") Transcript provided by NPR, Copyright NPR.